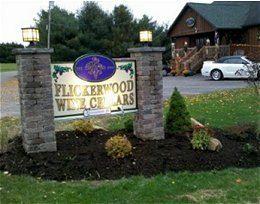 Flickerwood Wine Cellars, known as the Wine that Rocks, opened on Memorial Day Weekend 2000 with 3 employees and 4 varieties of wine. Now after 15 years we have about 15 employees, an additional location, and 27 varieties of wine. We are humbled by this and thank all of our wonderful clients over the years. Many of you have become extended family members. We love wine and we love rock and roll. Our dad, Ron, the original FWC wine maker is the best drummer in the state. 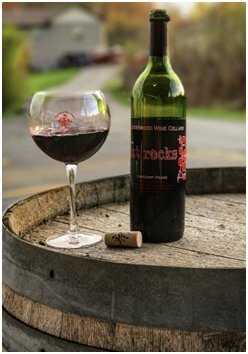 He has been playing drums since he was 12 years old and his current band will rock once a month as the house band at our winery. Our brother, Rick, the current FWC wine maker, is a rock star in his own mind. He is a lead singer in a rock band and can play the drums with the same rocking sound as our father. We have added a nice variety of liquor and beer to our already rockin wine list with the purchase of a Restaurant Liquor License. Ask for Rick’s Bloody Mary, you won’t be disappointed! We have expanded our food menu to include several hoagies and a grinder, including the Zampogna Family Meatball sub. Panini sandwiches and individual pizzas and pizza logs are also available along with the regular daily menu of appetizers. The kitchen is open whenever the winery is open so food is available for your enjoyment every day.